One of the most popular web browser in the world which comes preinstalled in all the Windows machine you purchase has a serious security issue which is due to a security flaw which is existing from the IE6 and above, this issue has not yet been patched by Microsoft. This security flaw is called as the zero day exploit, using this an attacker can install malware into your system and take control of your accounts, data and even the whole system, the sad thing in this that you will not know any of these when it is happening. This flaw is know to use a Flash based exploit to take over your computer, this is possible to do in every iteration of Internet Explorer from IE6. This is the first time the CERT from US and UK have recommended to stop using a specific web browser. They have asked the users to stop using Internet Explorer until Microsoft fixes the issue. FireEye the company which discovered the bug has asked the users to enable the Enhanced Mitigation Experience toolkit in Microsoft Internet Explorer and to disable the Flash plug-in be be safe, but they say this can protect us only to a certain extent. FireEye and CERT has asked the users of Internet Explorer to switch to another browser like Google Chrome or Firefox which are out of this security flaw. 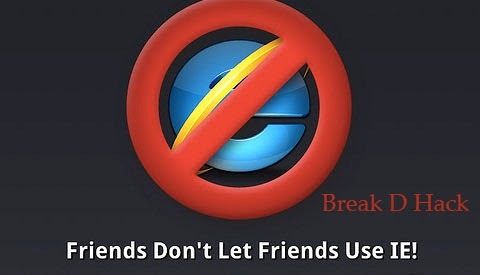 Since there are around 25% of the user use the Internet Explorer in their day to day works they can use the above measures to safe guard themselves, but we argue you to switch browser. Microsoft was not able to be reached for getting a comment on this, we hope they are seriously working on a patch.